The judges have spoken and the votes are in. 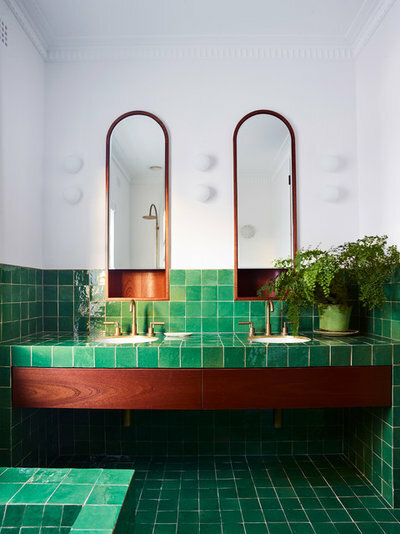 From more than 600 entries from Australian designers for their projects within our borders and beyond, a shortlist has been announced for categories ranging from residential design and decorating to hospitality, public and retail interiors. 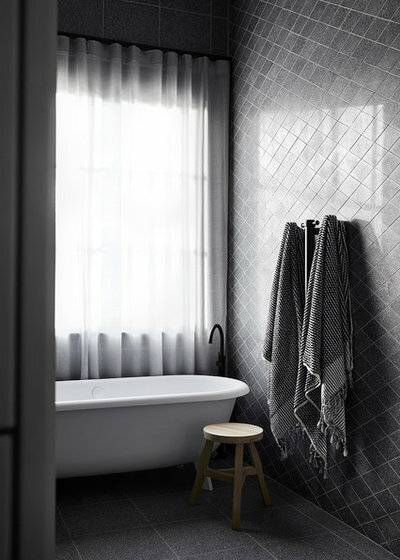 We’ve picked some of our favourites from the interior design and decoration categories for your viewing pleasure. Project description: With bold metals and monolithic stone elements, Concrete Conceal House embodies a feminine aesthetic with proportion and alignment at its core. 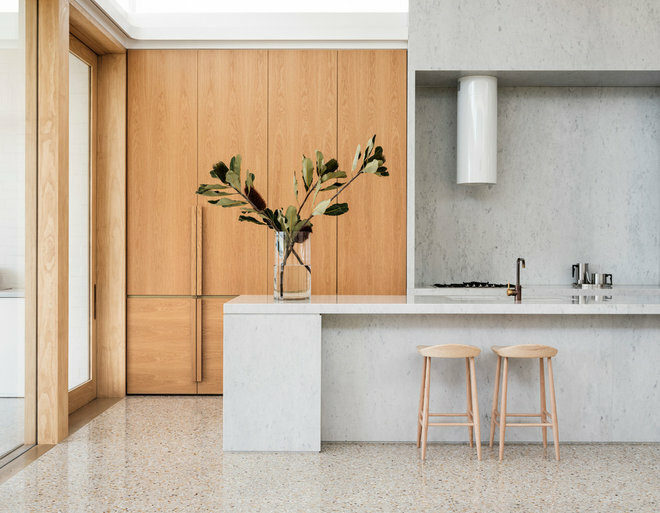 A refined palette of minimal materials, the repetition of timbers and stones in varying formats provides luxury moments in a considered and functional floor plan. Photography: Christopher Fredrick JonesProject description: This renovation of a post-war house creates a generous home for a young family. Living spaces are layered with connections to the landscape setting and detailed with a warm, natural palette. The home originally belonged to its owner’s grandparents, so its renewal is powerfully tied to family memories. 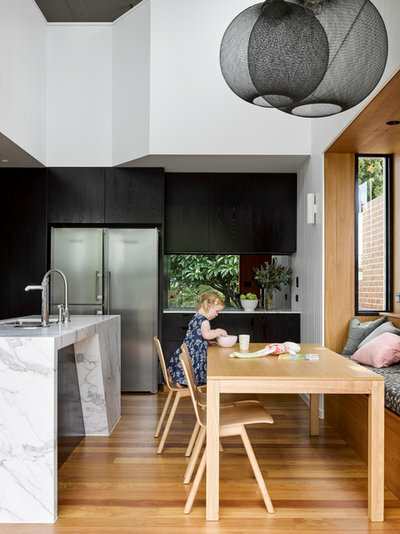 Photography: Tom BlachfordProject description: Highbury Grove is a renovation to a semi-detached Victorian-era property in Melbourne’s Prahran. 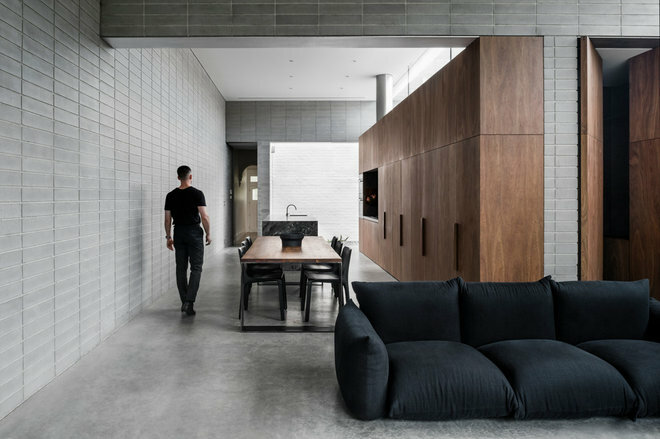 Concrete-block walls create seamless laps between interior and exterior, while apertures between the walls create framed views outwards towards neighbouring trees or to a courtyard garden. 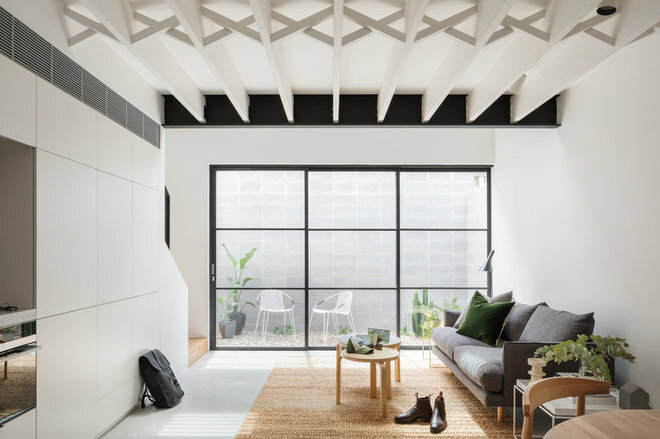 Photography: Felix ForestProject description: This project was the refurbishment of an 1890s house in Sydney’s Darlinghurst for a family of four. The building is unique for being triangular in plan, with a warehouse on the ground floor and a Federation-style house on the upper two levels. 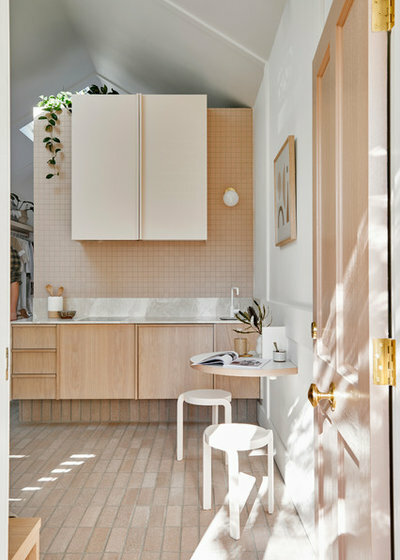 Photography: Nikole RamsayProject description: Originally built in 1874, the 32-square-metre worker’s cottage has been transformed into a fully self-contained studio. Through attention to detail and experimentation with materiality, the small space has a big impact. Photography: Anson SmartProject description: The design of this North Bondi Beach apartment tells a multi-layered story involving bold colour, geometric pattern, varied texture and eclectic furniture, all set against the backdrop of an iconic view. The result is a cohesive yet energetic collection of spaces sitting comfortably in the equally vibrant neighbourhood. 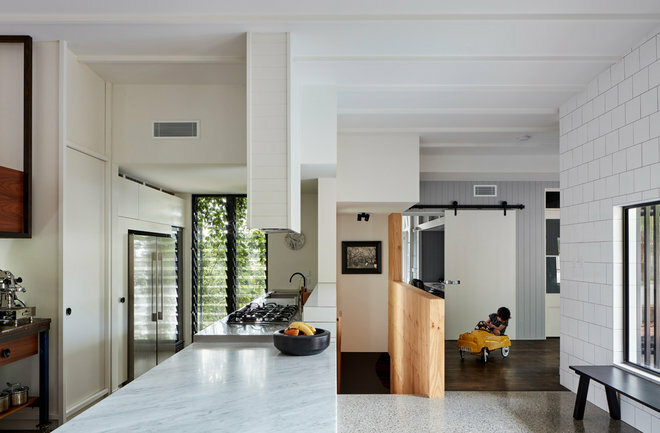 Photography: Christopher Frederick JonesProject description: This classic four-room Queenslander transforms into a robust family home via a living pavilion extension down one side of a leafy site. An enfilade of spaces facilitates continuous sight lines across old and new, and facilitates breezes across this passively ventilated house. This is a home designed for living. 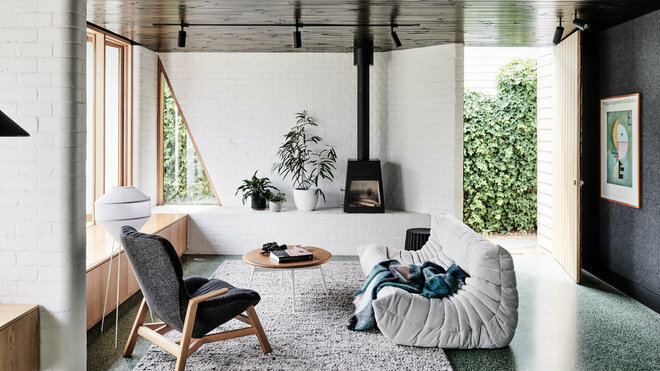 Photography: Tom Blachford, Ruth WelsbyProject description: Brunswick West House is a compact alteration and addition to a California bungalow in Melbourne’s north. Held within a series of sculptural masonry walls, the addition is defined by a layering of light-reflecting surfaces and warm, playful tones, that ultimately seeks to re-engage the interior with the verdant garden beyond. 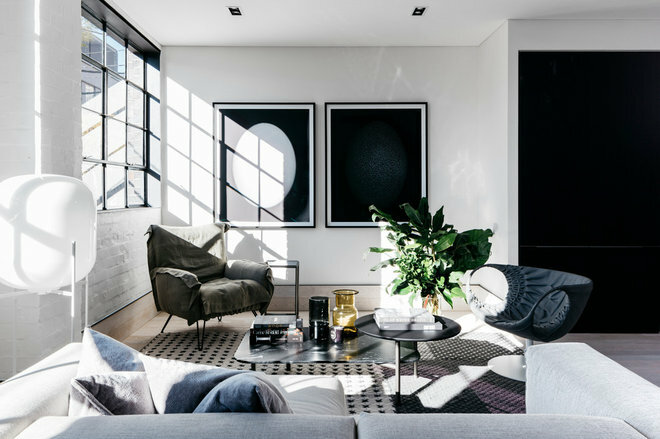 Photography: Derek SwalwellProject description: As a modern renaissance home, the St Vincents Place Residence is a new archetype developed through reinterpretation of classical references with a modern sensibility. The client, as a patron, put his belief in architecture, artists and artisans to create a nourishing environment by inscribing contemplative experiences into the physical form. 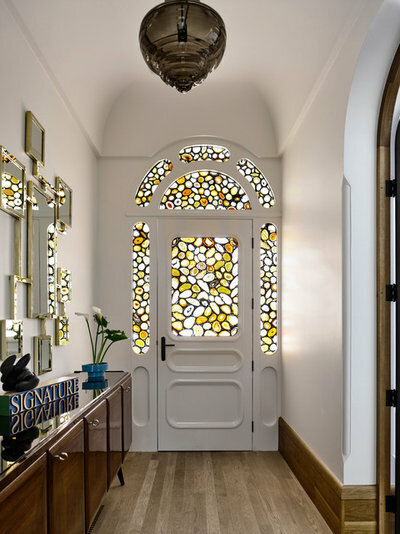 Photography: Elisa WatsonProject description: Retro glam vibes and an ultra-luxe attitude restore this former Spanish consulate to glory with an unapologetically bold and contemporary re-imagining. 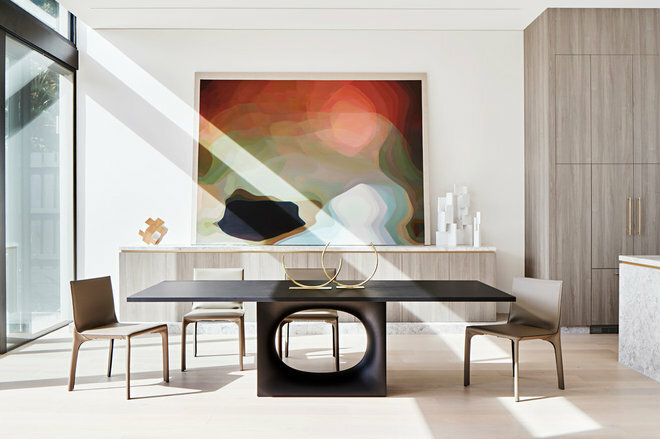 Seamlessly connected spaces and high-gloss finishes artfully blur the line between family home and luxury hotel, creating a striking modern residence that’s as practical as it is party-ready. Photography: Katherine LuProject description: Loft House x2 replaces cars with people. Collaboration between two inner-city neighbours saw their rear-lane parking spaces replaced with conjoined one-bedroom houses. On a footprint of just 35 square metres each, they will serve as both traveller’s accommodation, and a secondary family home. 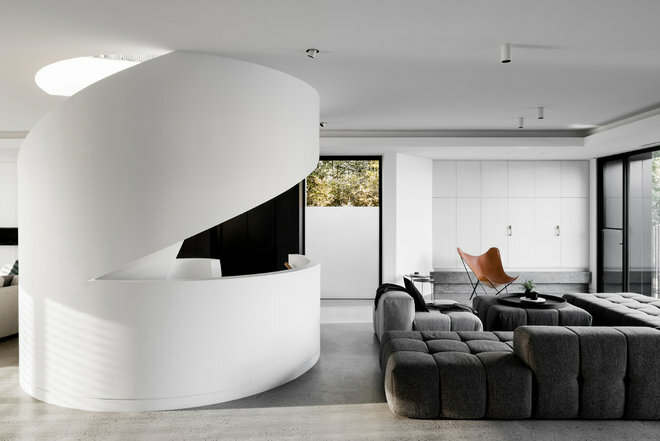 Photography: Tom BlachfordProject description: Oreo House is a play of form, texture and contrast. A spiral staircase, with its smooth plaster finish corkscrewing from the lowest level to the upper terrace, is the central focus. Black textural forms bookend the stair at each level, providing a contrasting composition as you circulate the home. 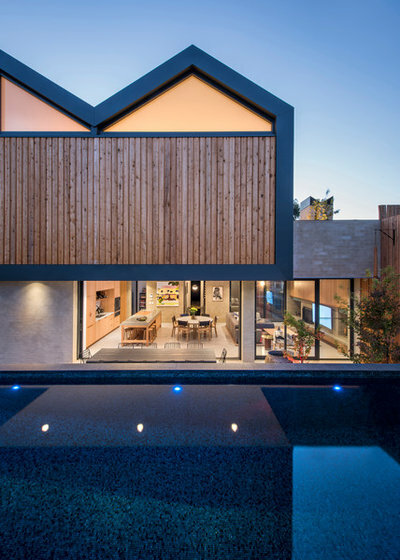 Photography: Robert WalshProject description: A new house in a dense beachside Sydney suburb, this project required clever management of privacy and views. 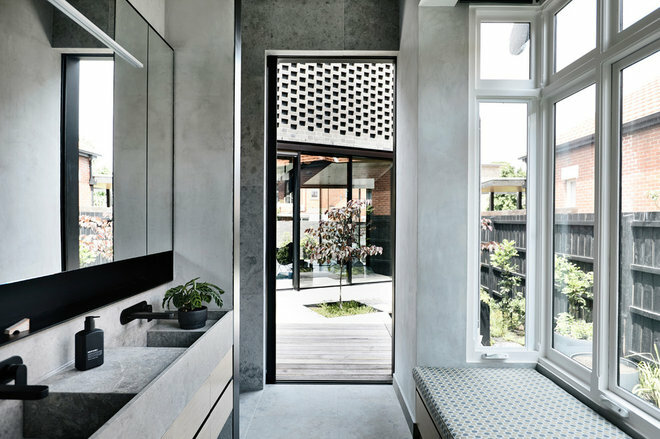 Internal courtyards, lofty spaces and muted materials were used to create a sense of openness and lightness in what would otherwise have been a tunnel-like home. Photography: Sharyn CairnsProject description: The rolling green countryside and lush vineyards that surround this family farmhouse inspired the approach to the interior design. The idea was to merge the forms of traditional farmhouses with clean contemporary lines while offering visual continuity with nature. The result is a modern interpretation of traditional barn architecture. 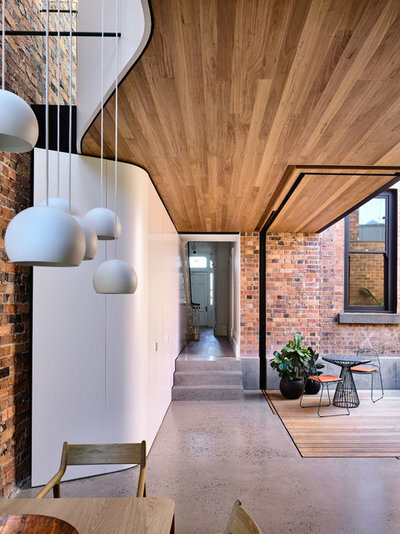 Photography: Derek SwalwellProject description: North Melbourne Terrace explores the sensitive knitting-and-stitching, deconstruction-and-reconstruction, of an A1-Listed heritage marvel within inner-city Melbourne. 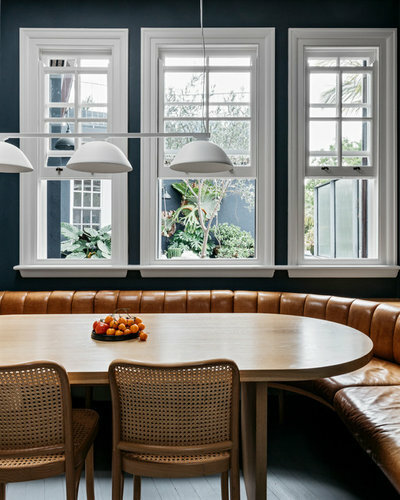 Highly customised and tailored, the design provides a backdrop to this family’s life – one that delights in the experience of materiality and the story of old and new. 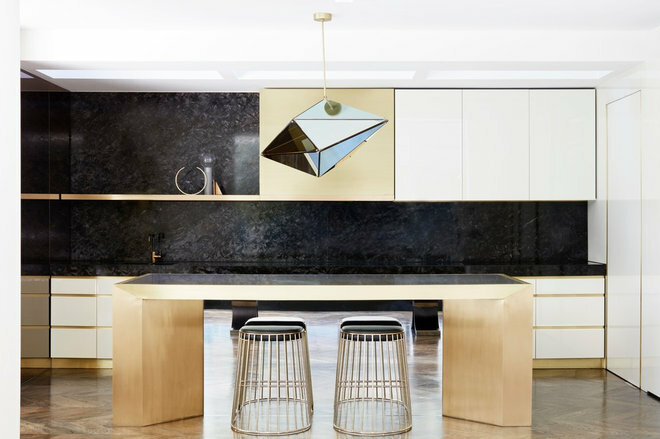 Photography: Derek SwalwellProject description: An existing heritage building is transformed through the introduction of a modern two-storey addition that playfully re-interprets the distinctive geometry of the original dwelling through a contemporary lens. Capturing abundant natural light and garden aspects, the new addition employs a refined and subtle palette of brick, steel and timber. Photography: David SieversProject description: The existing Percy Street residence is a turn-of-the century double-fronted cottage. The aim of the design was to maintain the current character by using the roof form as the basis for the extension.